An unceasing problem of our prevailing society is the fair division of goods. 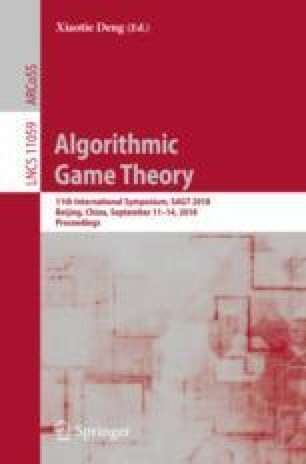 The problem of proportional cake cutting focuses on dividing a heterogeneous and divisible resource, the cake, among n players who value pieces according to their own measure function. The goal is to assign each player a not necessarily connected part of the cake that the player evaluates at least as much as her proportional share. In this paper, we investigate the problem of proportional division with unequal shares, where each player is entitled to receive a predetermined portion of the cake. Our main contribution is threefold. First we present a protocol for integer demands that delivers a proportional solution in fewer queries than all known algorithms. Then we show that our protocol is asymptotically the fastest possible by giving a matching lower bound. Finally, we turn to irrational demands and solve the proportional cake cutting problem by reducing it to the same problem with integer demands only. All results remain valid in a highly general cake cutting model, which can be of independent interest. Supported by the Hungarian Academy of Sciences under its Momentum Programme (LP2016-3/2016), its János Bolyai Research Fellowship, Cooperation of Excellences Grant (KEP-6/2017), and OTKA grants K108383, K128611. This work is connected to the scientific program of the “Development of quality-oriented and harmonized R+D+I strategy and functional model at BME” project, supported by the New Hungary Development Plan (Project ID: TÁMOP-4.2.1/B-09/1/KMR-2010-0002). We thank Simina Brânzei and Erel Segal-Halevi for their generous and insightful advice.